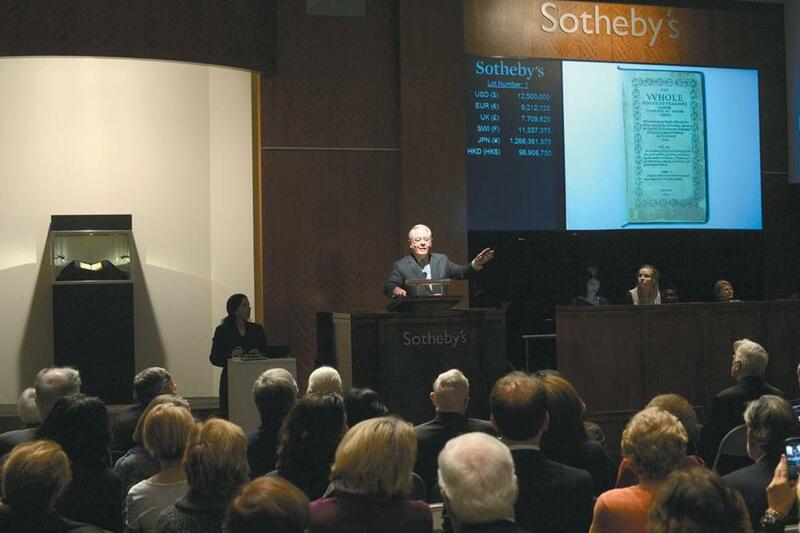 Auctioneer David Redden discussed the book during the sale in New York on Tuesday. It was sold at a one-lot auction by Sotheby’s. The first book printed in what would become the United States set a second record Tuesday night — it is now the most expensive printed book auctioned in the world. A first-edition copy of the 1640 Bay Psalm Book was sold by Boston’s storied Old South Church at Sotheby’s New York for nearly $14.2 million, shattering the record set in 2010 when a copy of John James Audubon’s “The Birds of America” was auctioned for $11.5 million, Sotheby’s said. The psalter, a translation of the Book of Psalms by prominent Puritan ministers, was purchased by David Rubenstein, a businessman and philanthropist who promised to loan it to libraries across the country, Sotheby’s said in a press release. Only 11 copies of the Bay Psalm Book still exist. Until Tuesday night, two of them belonged to Old South Church. By comparison, it is believed that 48 copies of the Gutenberg Bible have survived the centuries. The Copley Square church will use the money from the auction to further its ministries in Boston, which range from aiding the homeless to assisting AIDS patients, Senior Minister Nancy Taylor said. Taylor said the proceeds will be added to the church’s existing $23 million endowment to ensure charitable efforts are sustained long into the future. “Our future is as bright as our past is glorious,” Taylor said. The Bay Psalm Book,amore literal English translation of the Book of Psalms, was one of two owned by the Old South Church. Old South Church was established in 1669 and has been the home to many famous parishioners including Samuel Adams, Paul Revere’s co-conspirator William Dawes, and a very young Benjamin Franklin, according to the church’s website. It has been involved in social movements throughout Boston’s history, including the American Revolution, the abolition movement, and most recently the push for gay rights. The Bay Psalm Book, which was printed on Holyoke Street in Cambridge, is a more literal English translation of the Book of Psalms. The Puritan ministers who wrote it believed a literal translation from the original Hebrew was more theologically correct. 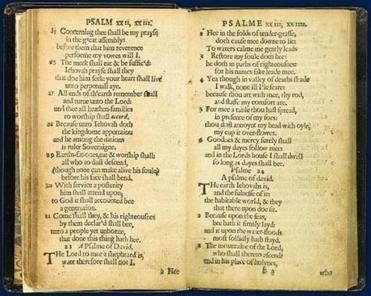 It became the leading psalter for 17th-century Massachusetts Bay colonists, but was replaced by a more poetic translation of the Psalms about a century later, historians say. The language of the Bay Psalm Book has been criticized for its lack of elegance. “We are thrilled that this book, which is so important to our history and culture, is destined to be widely seen by Americans who can appreciate its singular significance,” said David Redden, director of special projects and worldwide chairman of the Sotheby’s books department. The decision by the congregation last December to sell the psalter roiled the parish, although in the end, the sale was overwhelmingly approved in a vote by congregants, 271 to 34. Jeff Makholm, a parishioner from Beacon Hill who opposed the sale at the time of the vote and resigned as the church’s historian in protest, would not expressly criticize the sale Tuesday night. “I believe what my old congressman Tip O’Neill used to say is that if a group makes a decision and votes on it and goes forward, it is wise for the rest of it not to criticize the decision and move on,” Makholm said. Makholm did express disappointment at the price the psalter fetched; some estimates before the auction predicted it could go for $20 million, or even higher. But Makholm said he was hopeful the money will allow the church to keep many of its other historic artifacts, including a collection of Colonial silver. “It is my hope that the collection given over the course of centuries to Old South Church does not get broken up,” he said. Taylor said plans to sell the silver collection were still being developed. The church voted to sell the silver at the same time it voted to sell the psalter. At that time, the church planned to use some of the money to alleviate a backlog of maintenance projects in the 19th-century building, but Taylor said those issues were resolved with existing funds. The book was put on exhibition across the country before Tuesday’s sale, Sotheby’s said. Rubenstein, the new owner, plans to continue its tour. According to Sotheby’s, he will loan it to American libraries before finding one where it will be on long-term loan. Rubenstein, who could not be reached for comment Tuesday night, is number 209 on the Forbes 400 list of America’s richest people. He was worth $2.6 billion as of September, according to the publication. Taylor said the copy auctioned Tuesday and the church’s remaining copy are in excellent condition, but the one still belonging to the church fared slightly better over the centuries. The church keeps the remaining psalter at the Boston Public Library as part of a larger collection of rare texts that belonged to an 18th-century pastor of Old South. Another copy of the Bay Psalm Book resides a short distance across the Charles River at the Harvard College Library, Sotheby’s said. The Library of Congress, the New York Public Library, and Yale University Library also have copies. The last time a Bay Psalm Book sold was in 1947 for $151,000, a fraction of its 2013 value, Sotheby’s said, though that was also a record at the time. Nicholas Jacques can be reached at nicholas.jacques@globe.com.